Paul had a laparoscopic surgery called a "one-step colectomy." This is the story of his recovery. I recently had a laparoscopic surgery called a "one-step colectomy" to remove a diseased portion of my colon that was suffering from chronic diverticulitis. While there is currently plenty of information available on the procedure, I found nothing online about what to expect during the recovery process. If you're in the same boat, I hope you can benefit from my experience. I was put under general anesthetic for the surgery and was sent to a waiting room while I recovered consciousness after. I woke up groggy. Shortly after waking up, hospital staff rolled me on a bed to my hospital room where my family was waiting for me. The nurses were totally attentive, but I was still feeling the effects of the anesthetic. At some point, they put in a catheter and an IV port into my hand, and I noticed that my stomach was shaved where they made the incisions. My surgeon told me that I needed to prove I could handle solid food before getting released from the hospital. First, my bowels needed to wake up. I was told that the best way to get my body functioning again was by walking, so somewhere around 4 or 5pm (after having surgery in the morning), I asked the nurses to help me stand up and take a few steps. I was sore from the surgery, but feeling no pain yet. My legs were wobbly, but I took a few steps and got back into bed. Later that night, I asked to get up again and this time I took a short walk outside my room, moving extremely slowly. I was given a PCA pump with Dilaudid for pain management. Never having gone through surgery before, I wasn't aware of any allergies to medication. After the general anesthesia wore off, I pushed the PCA button and almost immediately started feeling nauseous. The nurses gave me medication for the nausea, but then a massive migraine headache set in. The nurses kept asking me about what level of pain I was feeling on the pain scale. After surgery, I was at about a four or five level, but the headache I got from the pain medication was an eight plus. I couldn't believe my head hurt worse than the three incisions on my abdomen and all the cutting between the stomach muscles. I throw up when I get severe migraine headaches, so, each time I threw up, my stomach muscles contracted and that increased the pain. The first night in the hospital was really miserable. The surgery had gone well, but the headache and throwing up made me feel like I was set back a day in my recovery. A noticeable pain that does not interfere with most activities. A pain that is strong but the patient is still able to function. A very extreme pain that makes the patient unable to function. This is the pain scale often used in hospitals that allows patients to communicate their level of discomfort to the staff, like I did with the nurses. On day two I was able to get some Excedrin migraine medicine and I stopped the PCA pump completely. Instead, I switched to a Vicodin-type oral medication for pain. Someone without a Dilaudid allergy would normally be kept on longer, though. 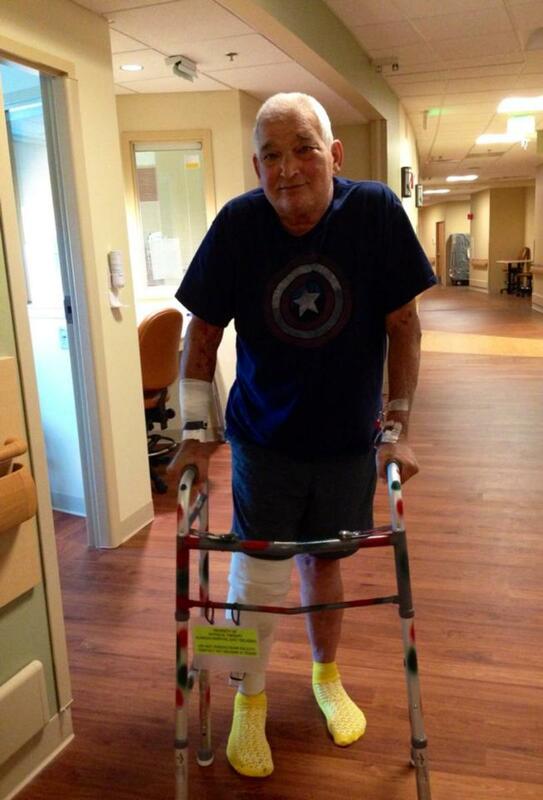 I still had the catheter in, but I went for twenty-minute walks about four or five times a day. My diet consisted of only ice chips. I was super hungry because I hadn't eaten since Monday night (and it was now Thursday). At night they put devices on my legs to keep the blood circulating. They were uncomfortable, but I was eventually able to sleep with them. I also got a nightly shot in the stomach with a drug that helped prevent blood clotting, and another oral pill that helped keep part of the Vicodin from binding to my guts and shutting them down. On Friday (day three) I was put on clear liquids. I got up every two hours around the clock and walked for 15 to 20 minutes. I was able to get my catheter out that morning. I really didn't want to have visitors with a catheter in, so having it removed was a relief. I took a shower with a plastic bag over the hand with the IV port and then was allowed to put on my own clothes under the hospital gown. Day three was a big step forward. 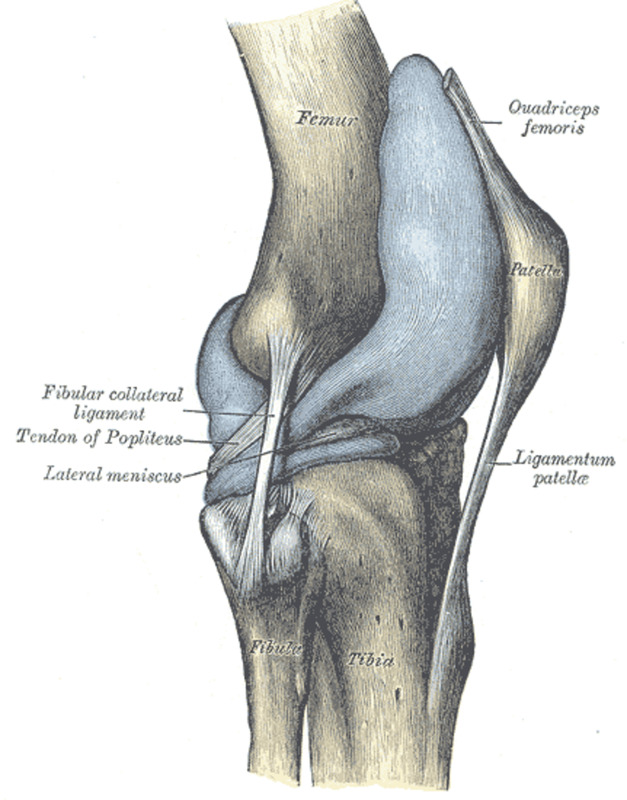 The pain from the surgery was at a two or three at most. My headaches were mostly gone. I was drinking fluids, and was even able to drink a ginger ale. The carbonation was piling up in my stomach and not passing through, though, which was a big concern. The nurses said that if I started vomiting, that I'd have to stop drinking fluids since the fluids weren't passing through my guts. I started to get very worried. I walked as much as I could, but the bloating from the carbonation and fluids was uncomfortable. I had hoped to be moving on to a soft diet and progressing towards going home by now, but when I got bloated I had to switch back to a diet of ice chips. I expected my recovery to be linear, and I was very disappointed to learn that it wouldn't be that easy. It felt like I was taking one and a half steps forward, then a full step backwards. That night I finally passed a little gas, which was a huge relief. Passing gas is the first sign that your bowels have started working again. My recovery was back on track. By day four I was taking walks around the clock. I moved much quicker and was feeling hardly any pain. I was almost completely off all pain meds. That morning I had a small bowel movement, but it was bloody. I flushed it, and told the nurses about what had happened. They politely asked me not to flush the next one so they could look at it. My surgeon's weekend representative was supposed to visit before 11am and advance my diet to full liquids or soft foods, but she didn't show up on time. I kept walking and asking the nurses if she was doing rounds yet. Finally, I got one of the nurses to call her and she advanced my diet to soft foods over the phone. My first food in five days was a grilled cheese sandwich and cream of asparagus soup. That was around 1pm and I was hoping to go home after eating. At 2:30pm I got the good news that I could go home and resume a full diet. I was a little tentative about eating normally, though. By days five to thirteen, I was slow and sore, but not in much pain. I got tired quickly. One Sunday (day 5), I made it to my neighbor's house for a bbq and ate a seared ahi salad. My stomach cramped up and I had severe diarrhea, which was quite painful. Each day I walked about one mile and did several short walks down my block and back. Between the walks, I slept. By Thursday (day 8) I had recovered enough to return to work in the office for a few hours a day, though I still got tired quickly. When a family emergency came up, my wife left me alone for a few days with my three young daughters. I wasn't at full strength yet, but I was able to watch them and take care of them for six days with a little help from friends and family. On Thursday I had an almost regular stool. I walked more quickly and was now able to drive. At this point, it had been several days since I completely stopped pain meds. My stomach area was still sore from the laparoscopic surgery. It felt like there was a hole in my muscle the size of a tennis ball. I had to sleep on my back and if I slipped to my side, it would start to ache pretty quickly. 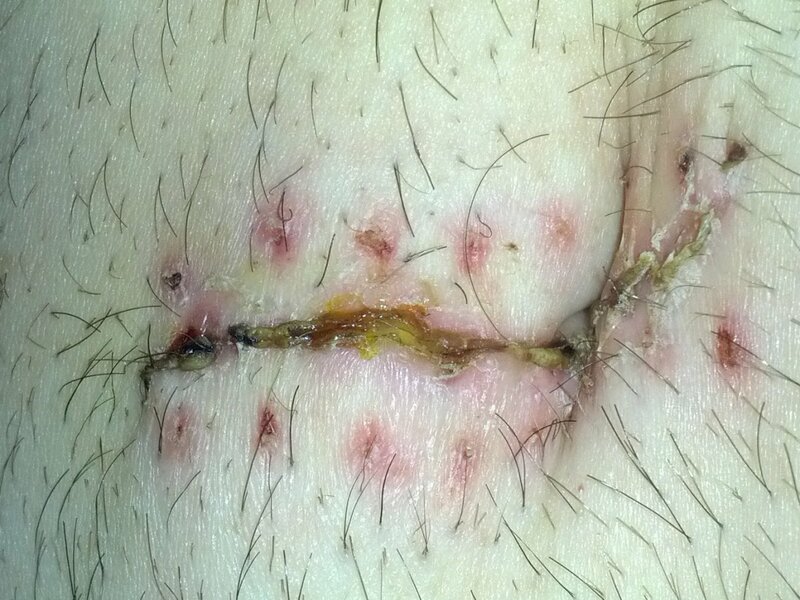 On Monday (day 13) the staples were removed during my first appointment with the surgeon since the surgery. I felt better each day since I'd been home. I walked over two miles the previous day, and I was feeling about 75% at this point. The doctor told me I was recovering in the top 2% of patients who had this surgery. Wait three more weeks before doing any core exercises (that's just about five weeks after the surgery). He said if I tried to do them sooner, I risked getting a hernia where my stomach muscles were stitched up. Avoid lifting more than 30lbs. If I felt pain during my normal daily activities, I should rest for two or three days before resuming. Listen to my body and only do the activities that didn't cause pain. These three things caused my stomach muscles to contract, which was really painful. I tried holding a pillow over my abdomen and applying a little bit of pressure, which helped, but I still couldn't do a full cough. Additionally, the three incisions needed a little care. When I showered, I patted them dry when I was done. Getting them wet wasn't a problem. The pain from the incisions and the area that got cut between my stomach never hurt more than a five on the pain scale. That part was very manageable. The stomach muscle incision has sutures that dissolved. The incision in my belly button is the largest of the three, and it was by far the most sore part on my body. My surgeon said that most people don't walk well, aren't as hungry, and aren't having regular bowel movements within two weeks of a colectomy, so I feel pretty lucky. I found the best colorectal surgeon that I could and had it performed laparoscopically. He says my wife has a higher chance of getting diverticulitis than I do now (unlikely). 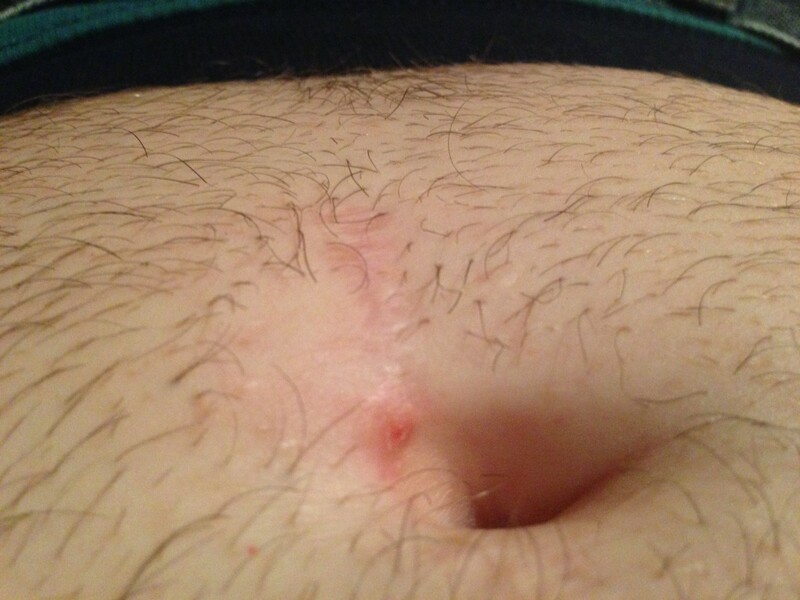 About two years after a colectomy, the scar is just barely visible. More importantly, my gut feels great (no more diverticulitis). Did you have sharp gas pains & cramping within the first few weeks of recovering from laparoscopic colectomy surgery? What types of food did you eat? High fiber/low fat or low residual diet or a combo? Did you need to take some kind of OTC pain meds for the laparoscopic holes burning sensations? Your article was very helpful. I am 2 weeks out after the same surgery for the same reason. I definitely had some sharp gas and a rush or two to the bathroom once my bowels started working again. I ate a low residual diet at first. I think I got off all pain meds (prescription and otc) very quickly. Thank you so much for posting this. My son is at Stanford right now on day 3 of his laparoscopic colectomy. We stayed nearby for the 1st 2 days, but had to return home. He had the same reaction as you from the Dilaudid. He also stopped taking it. The only thing we heard from him yesterday is that he is uncomfortable from bloating. Hearing your experiences has really eased our anxiety. + we're going to see him today. Steven, Wishing you well in your recovery and thanks for sharing your procedure. Thank you Paul and others for sharing. I am on day 8 following partial (about 12 inches) sigmoidectomy done laproscopically. No staples, they used some kind of glue. (Univeraity of Miami Hospital) Diseased portion probably dirverticulitis but waiting on labs. Surgery went well, no problems with pain meds (Dilaudid and Troadol). Allowed solid food on day 3. Still having some pain (3 - 5 level) and some constipation. As some of the pain is internal cramps (like before the surgery) I started taking Levsin (anti-spasmodic) which has helped somewhat. Doc said I could eat anything except raw fruits and vegetables. However, I think I need to be more discerning than I have been the last few days regarding what foods and drink I ingest (i.e., keep away from chocolate and coffee). I felt better yesterday than I do today so I agree that recovery is not linear. More will be revealed. Here is how I found the surgeon. I asked who does the most of these type of surgeries laparoscopically at Stanford and UCSF. Then I asked those doctors who they would go to if they needed this surgery. I also asked several gut doctors who they would go to for the operation. Each person gave me a couple of surgeon's names and I narrowed it down to the name that everyone kept recommending. I'd highly recommend starting with UCSF Medical and Stanford Medical. When I did this a few years back, Dr. Mike Abel at CPMC was the surgeon that just about everyone was recommending for this procedure. Looking to have to have the same surgery for the same reason. How did you go about finding "the best colorectal surgeon"? I had this surgery a year ago at a university hospital. When I left recovery and went back to my room, the nurse walked with me for about 5 minutes. I then ate dinner - soup and pudding. 24 hours later I went home. I was 66 years old, my first time in the hospital, had half of my colon removed and had very little pain. So go in with a good attitude. Having mine done in 2 weeks! Thanks I will be having this done in four weeks. This was very helpful. Thank you for your blog post. It is very helpful. I had a laparoscopic colectomy on my traverse colon to remove a polyp that was 7 cm - three weeks ago. I am still on pain meds (Norco) and I take col-rite for constipation. At first, I needed to take pain meds every 4 hours, then it went to every 6 hours, and now I can stretch it out to every 8 hrs. My bowel movements are off and on. I tried to eat normal food the first week (not a good idea). I would recommend that others stay on soft food (soup, steamed spinach, yogurt, porridge) for about 3-4 weeks (at least only eat one normal meal a day). At night, it's harder for me because I sleep on my back (turning on the side is still uncomfortable and difficult). I am still waiting to see when I can sleep normally again. It is very inspiring to hear that the author recovered 100%. I can relate with being tired a lot. I am not working at the moment; it has been 3 1/2 weeks since the surgery. I have 4 incisions. The pain comes and goes...I am usually at a 5-7 in pain level. The discomfort moves around too; at times it's on the left, then right, then below my belly button, or above near the middle of my upper ribs. I cannot lift more than 10 pounds. I can walk about 1/2 mile at most. I try to walk 2-3 times a day. I also take naps. Thanks everyone for sharing your stories. It helps to hear that I am not the only one going through this recovery. It's a tough one. Your comments are right on, Fortunately I only had some slight stomach pain and no throwing up at all. My biggest concern is when I will have the welcomed BM. I am passing gas really well. Thank you so much for your detailed experience. Thank you for sharing your experience. Just this morning, my dr referred to a surgeon. Have had 4 Diverticulitis attacks in 4 months. The details of your surgery and recovery have helped me not be so terrified. 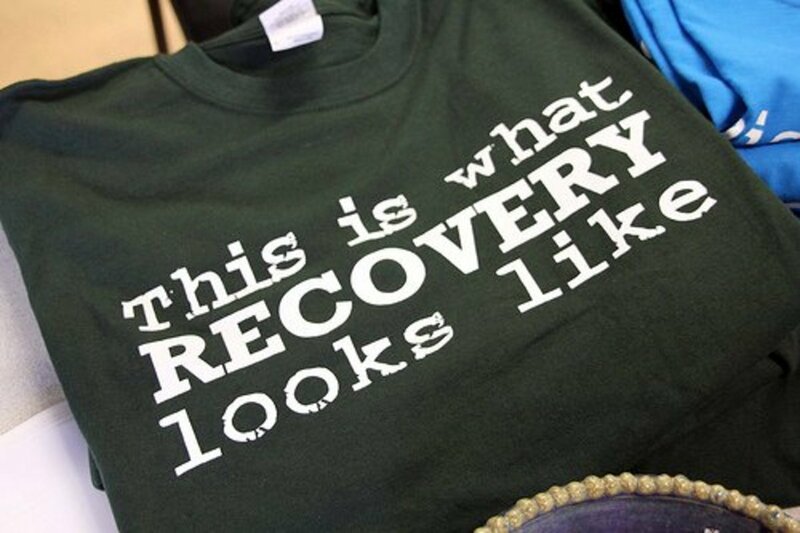 Great description about the recovery process. Was really helpful to have another case to compare my progress with. I'm on day 5 post-op and got released yesterday. One c section like scar, no staples and 2 additional incisions (tiny). I didn't have issues with dilaudid, but on day 2 it just bothered me that I had to get groggy and eventually sleep to handle the pain. After the self administering pca got removed I switched to something else called toradol which handled the pain more 'directly' and didn't just make me care less about it. At night to sleep better I took a shot of dilaudid again but was uncomfortable with the intial rush you get from a larger dose that gets administered via iv syringe. After discomfort during the first 5 min I however slept really well through the night. I passed gas about 3 times on day 2 and passed a tiny drop of stool on day 3. On day 4 I had very liquid diarrhea and it's clearly moving into the right direction toward more normal stool. I am taking it easy with diet and started eating low residue diet since day 3. So just very easy to digest stuff. Been walking a lot and the more I do the better it feels. My biggest issue at the moment is how it feels like everything is moving around in my guts and if I eat just a little too much in one go then it starts pushing thinsg around and starts hurting. Worried about the comments that after 2 years things still feel like that. Paul - Thank you for the advice about peppermint tea. I am using it and it works well. I am also now off of the nexium and taking mastic gum in the morning, and DGL (Licorice Root Extract) before I eat and Super-enzimes (after I eat). I am feeling well and starting (6 months later) to feel like I can eat anything and am back to full life energy. Thanks again! I am 11 days away from a Right Colectomy . There is no info on lint except this about the recovery process . I only eat foods with no fiber , my tummy hurts at about a 4-5 and I tire easily. I think I am doing well ! I sleep on my back with a pillow on tummy. Cannot sleep on side yet. I take walks . I do something each day ! I take Advil for pain as needed. My tummy is very fat !!! I look pregnant. I did not take any meds they sent me home with because of bad side effects . My arm moved on its own and that scared me. Wish I could play golf ? When ?? @donC17 there was diarrhea for a while, but I'd go back to your doctor. I did go back a few times and over the last couple of years I've gone in as well when I feel like my guts are hurting. One thing that each doctor brings up is stress and the impact on the bowel. If you haven't discussed stress with your doctor, I'd suggest doing so. Lastly, I found peppermint helped me. I drank peppermint tea a lot and there is even an over the counter peppermint that you can take that I think did help me a bit and still does. Paul - you mentioned that your guts were "out of sorts for a while"? I am two and 1/2 months out from my laproscopic surgery. I've had good days, but also have days with a lot of gas and, at times, nausea. I was prescribed Nexium for the gas, but now am experiencing severe diarrhea. Did youi have any challenges like this and any thoughts about this? Hopefully I never have to have this but if I do you've given me a sample of what to expect. I have had an umbilical hernia surgery and that was enough fun. I was working in a job that required lifting up to and over 100 lbs. at the time so the recovery was longer than I wanted but at 10 days shorter than the doctor thought it would be. Thank you Sir and take care. THANK YOU so much for posting this and for your descriptions!!! I'm scheduled for a partial cholectomy next week, and I've been searching for *anything* that describes the recovery process in more detail than simply time frames... and until I found your description, I'd been unable to find anything. Your description is exactly what I was looking / hoping for!! I've never had ANY surgeries before, so simply didn't know WHAT to expect. Thank you for taking the time to go through your recovery so thoroughly! I have had diverticulosis for six years. I also have Sarcoidosis and have been on immuno-suppression therapy for over three years. I had acute on chronic diverticulitis and had laparoscopic sigmoidectomy. I am day six post-op and feeling improved each day. Walking has been the best activity for passing gas. My healing may be slower because of my chronic Prednisone and immuno-suppressant use. I am eating small frequent meals that are easy to digest. Drink lots of water and stay hydrated. I do not have staples, but staple removal can be a bit ouchy. Thank you for sharing your experience. I did have blood in my stool for a few days. It was gone after about 10 days after surgery. At first there was quite a bit of blood. Each day it got to be less and less. Good job with ur blog it has helped me a lot . I has been 3 weeks after my surgery. All has gone well and I went back to work 2 weeks after. I have very little discomfort overall and I am eating a regular diet... No nuts yet. Of course I have had loose bowel movements and then some constipation.. My question is did u ever have any little blood in ur stool ? I think that I see some red blood mixed in with the stool. Thank you for your time. DJ, I'm glad you find it useful. I wish you well in recovery. Take it easy with food. Once your better, you may want to look into eating a Paleo style diet. I've found that after two plus years, I've started to have a little gut trouble again. I'm not happy about this at all. However, tweaking my diet to eat basically only whole foods (read the book called "It Starts with Food") it seems to have settled down and is getting back to normal. After having the surgery, and recovering, I don't want to have to do it again. It's better to give up some of the crap I ate and drank and try to keep a healthy gut. Thank you for this! I am 10 days post-op. My recovery has been really good, but I haven't had a lot of down time since I left the hospital (5 days after surgery). I have had some pain and have been searching and searching for real life experiences to see if it's normal pain or worrisome pain. I'm pretty sure I just need to slow down some. I have 4 small lap sites and 1 larger one. None of them have staples. I was eating a transitional diet on day 4 and have been able to eat what I want since I've been home, although some things I used to like just don't sound good or smart to me. I have been walking around good and my food has little to no problems passing through. Thank you again for your story! My guts were out of sorts for a while - It took about 2 years for everything to feel really normal. I'm not sure I'd characterize it as moving around, but there was a strange feeling. Interesting that you don't have staples. I think the best thing I did to pass gas was walk. I walked a lot! If you're having trouble ask your doctor. I know mine was really concerned when I got backed up for a day or two. Good luck in your recovery! I had a colectomy 13 days ago. My surgeon planned to go through my belly button, but there were some sort of complications and he ended up going through my hysterectomy incision, although I have an incision in my belly button (5 incisions total). 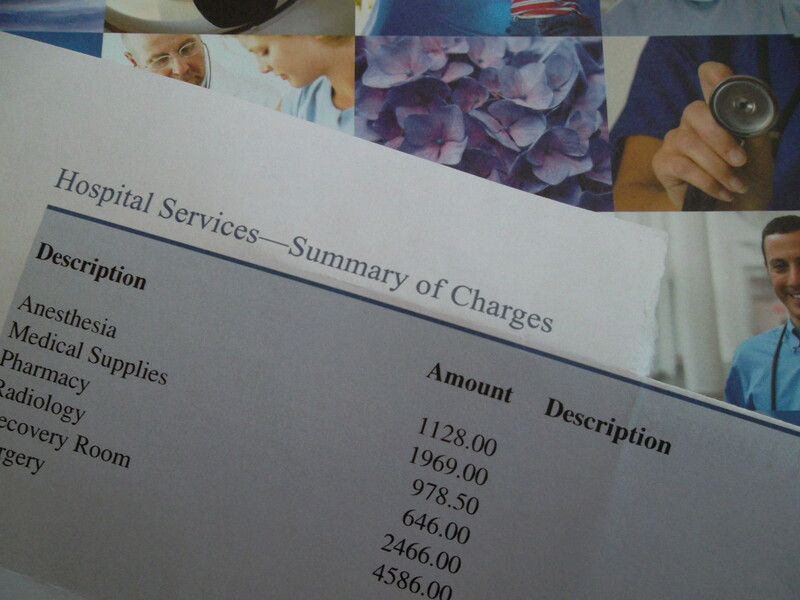 I was in the hospital 9 days. Now home for 5 days, I am sore and tired. Although I have some incision pain, mainly it feels as if my other organs are moving around, trying to find a new home. Did you experience that? If so, can you tell me how long that lasted. At this point, I can really only lay on my right side with a small pillow to support my stomach. I have no staples, only glue, so I'm grateful for that! My last question, besides chewing gum, is there anything in particular you ate to help pass gas. I'm having difficulty with this and it becomes very painful. Thank you for your assistance! I don't think getting the staples out was painful - it's hard to remember exactly now. Maybe a little pulling, but no pain. 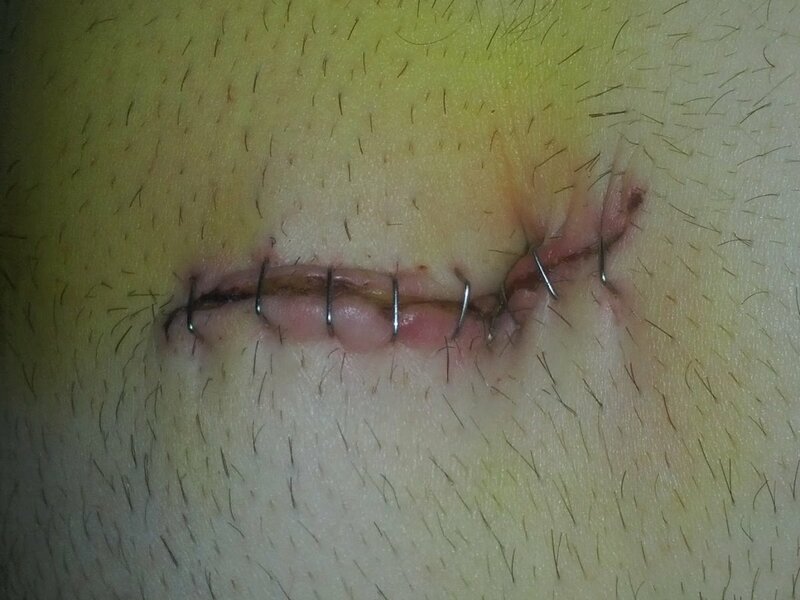 Been out of surgery 13 days now,just wondering was it painful when the surgeon took out your staples? I think my surgeon is waiting too long before mines come out..22 days before they come out! Very insightful. 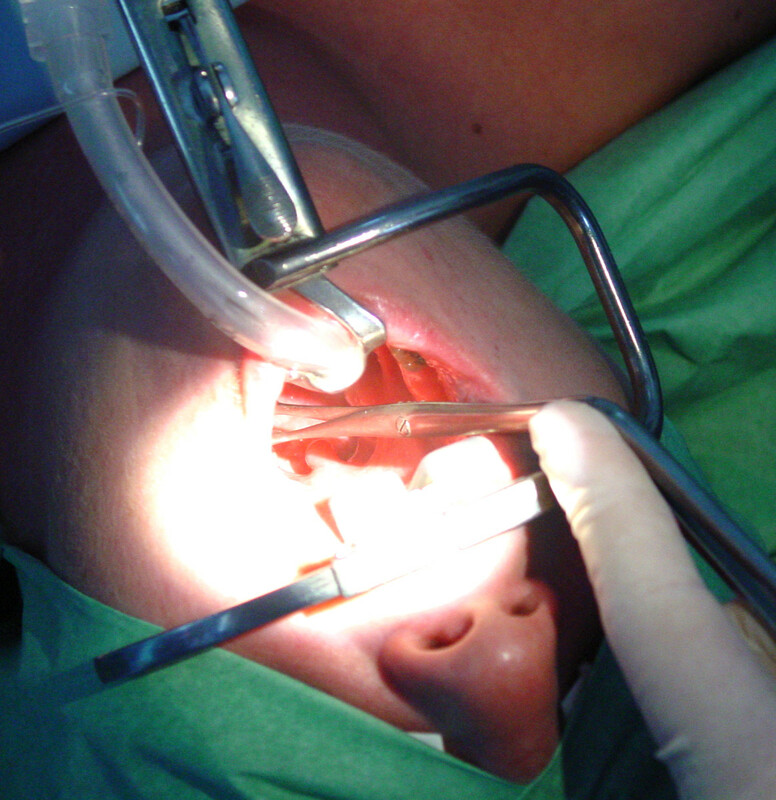 It is one thing to be going into surgery and get a clinical description of the sort of pain you can expect. It is quite another to have an anecdotal overview. I think the more information out there like this the better. It is nice for people to have human responses to surgeries to look to rather than just clinical ones. @Laura I'm about two years removed from the operation now and I'm so glad I did it. The first few weeks are the worst. After one year, I could still feel it flutter internally, but now I feel a 100%. Good luck in the recovery. Thank you so much for this information! I'm sitting in a hospital room with my husband right now on Day 3 post-op waiting for him to pass gas. He is getting discouraged. Your article helps a lot!!! To hear the other comments helps a lot too. He has experienced the nausea and headaches and it's good to feel like we are not alone. The idea to NOT think in a linear fashion helps so much. Thanks again. @Chad Glad it helped. I wish her well in recovery. I'm now really glad I had this done over one year ago. I cannot say thank you enough for the time you put into preparing this. I have been so worried for my partner whilst she is in the recovery stage and to read this and know she is on a similar recovery track to what you described here is so comforting. Having had this procedure, this is pretty darn accurate. I would highlight that progress is not that linear, and coughing and sneezing are painful. The dr's have the pain in the process well understood - its the extras that get you, like naseua and headaches. I had to stay in hosptial for a total of 4 days after procedure, 7 incisions, but i was passing gas on the 2nd day. I would only add, get in shape before surgery, b/c you will rely on some different smaller muscules (like triceps) while your core is healing. That is interesting. I am glad that it went well, and that you recovered fast. It is amazing how resilient the human body is! I have never undergone that kind of surgery, but I was in the hospital once after a car accident. I went without food for 2 days (but the second night they didn't tell me I wasn't going to get any food, so when the lady made her rounds with the menu, and I heard my neighbor pick a meal, I was so disappointed when she never came over to ask what I wanted). Going longer without food would be quite torturous! As for the thing they put on your leg to keep the circulation going, I thought that was the most comfortable part of the hospital visit. I also remember the Lovenox (anti-clotting shot). Even after the hospital visit, I had to stab myself in the stomach with it every day for several weeks. But at least I had no blood clots! I also got to experience what it was like to have staples on me (on my hip, though, not the stomach). I waited too long to get them taken out. I still have a pretty little scar, 5 years later! Anyway, enough reminiscing. This article will be most valuable for those who go through the same procedure as you. It's always nice to get information on something before you go through it. Thanks for sharing this with us, and I hope you are doing fantastic now! What a terrible ordeal you went through. I imagine that by now (7 months later) you have fully recovered and the scars are diminishing. The photos show just how sore that area must have been. 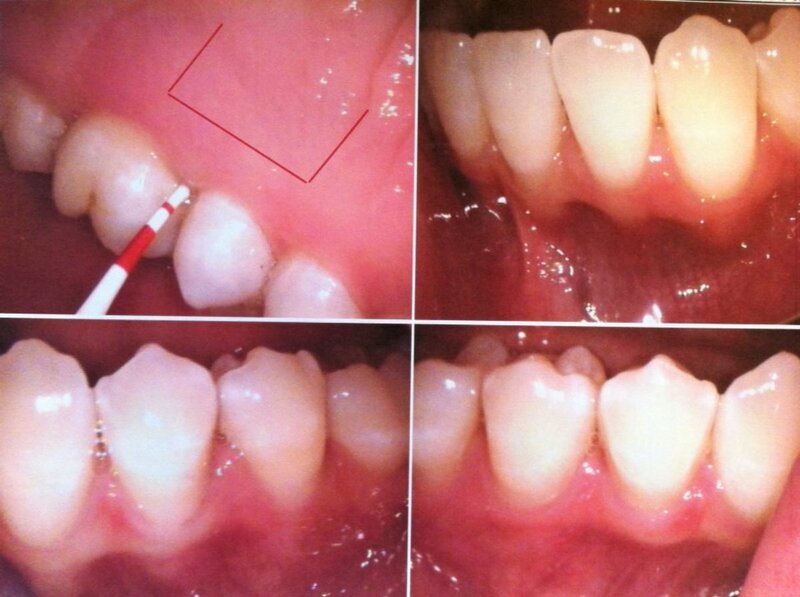 Great detail, which is most helpful to anyone who may have to have this surgery. Thank God, my colonoscopy was fine. Stay well and thanks. You were through quit an experience. I'm glad you recovered so well. It's amazing how resilient the human body is -- seeing how speedily you recovered. The fact that you are in the top 2% must be a result of being healthy to begin with, despite the diverticulitis. I know, this is too much information. I'm feeling really good. Yes, he said my wife now has a higher chance since I've had surgery. I think it's because the section of my colon that replaced the part removed is now in the position where diverticulitis develops and it hasn't been under the stress that position gets. That had to be so uncomfortable. I got a little squeamish just reading about your recovery. I'm happy to hear you're recovering and feeling better. The last statement about what the doctor said about your wife has me curious. Why would he say that? Because you had surgery? Take care! So sorry you had to go through this - intestinal issues have serious (and very dangerous) implications, so I'm sure you did the right thing by having this done. I had no idea it could be done laparoscipally - that's a comfort to know. Best wishes for a continued strong recovery. And thanks for this interesting and informative hub! Hope you are continuing to recovery well. The recovery process can be full of bumps and dips. Hope yours is smooth. I think the difficult part of recovery is that it's hard to emotionally prepare for what you'll go through, even though you can learn a ton about the procedure and risks. @simone Sorry you had to see my stomach. Not a pretty site. I promise to keep my shirt on in the office. 1. Recovery is TOUGH. It's awful to think how even things like sneezing would be so painful. 2. It's amazing how quickly you can heal!! I'm surprised that you were able to eat real food after just four days. That's spectacular. 3. Staples aren't just for paper. Here's wishing you a swift continued recovery! I was at Mills Peninsula Hospital in Burlingame. It's new and a very nice facility. Dr. Randy Wong did the operation. Originally I was going to have it performed by Dr. Mike Able. Mike was recommended as the go to guy for this surgery by almost every gastroenterologist in SF. Turns out he wasn't in my insurance network so I looked for a surgeon closer to where I live. I also looked into Stanford. I believe the colorectol surgeon that folks recommended there was Dr. Brown. I did quite a bit of research to find the best surgeon I could. The most important question to ask these type of Drs is how many do they do and if they do it with laparoscopy. Laparoscopy has a lot quicker recovery time. Lovenox (enoxaparin) is the anti-clotting shot. They burn like he77. I refused mine after 2 days and promised to walk more (which I did). Not sure about the other new drug for bowel motility. There is one called alvimopan. There may be new data supporting its use, but it WAS kinda plus/minus on the effectiveness scale (some think chewing gum to be as effective), BUT I'll be honest, I haven't looked up the most recent data in a while, so don't really know where it stands now. There may also be something newer that docs are using, but if so, I don't know of it yet. Anesthesiologists are always the last to know :). I wasn't given anything except IV hydration and walking to prevent ileum in my case, but those SF docs are pretty good at staying ahead of the curve, so they may have a new trick up their sleeve that I just don't know of. I'll ask my surgeon when I talk to him again. Were you UCSF, Stanford, CPMC? @tahoedoc do you know what the shot is that they give you to prevent clotting and the relitively new drug they give you to keep your bowels from getting impacted by the pain medication. Hi Paul, I hope you're feeling much much much better now. This is pretty scary, I can't imagine it. All the good lucks to you paul and wishing you all the best in life. Good Luck with your recovery Paul. Aren't you lucky that they knocked you out before inserting that cath-ow-ow-e-ow-ter thingy... I'm sure it will not be too long before you are back to the ab building and redeveloping muscle usage. Take care and thanks for the interesting commentary... all the best mate! PD. Paul- Hope you are feeling better every day! It isn't always linear, that recovery. I had a total colectomy (entire large intestine removed) 2 years ago at CPMC (fabulous Dr. Laurence Yee) via laparoscopy. Without boring you with the details, I had a 2-part procedure, so had 2 recoveries a month apart- total of 20 days in the hospital. I know what you are going through. The nausea medicine ondansetron (Zofran) has a well-known and common side effect of headaches in some people. Definitely not much fun, but glad I'm recovering and hoping to never have another bout of diverticulitis again. Doesn't sound like much fun. Glad to hear that you are doing well.